It’s time to come clean. I have a new obsession I’ve been holding out on. A summer snack that I just cannot get enough of. Something I sneak when no one’s looking, adiposity when I want something sweet, more about when the craving overwhelms me. I take a fresh strawberry and frost it with Nutella. It’s amazing. Heaven. Addicting. 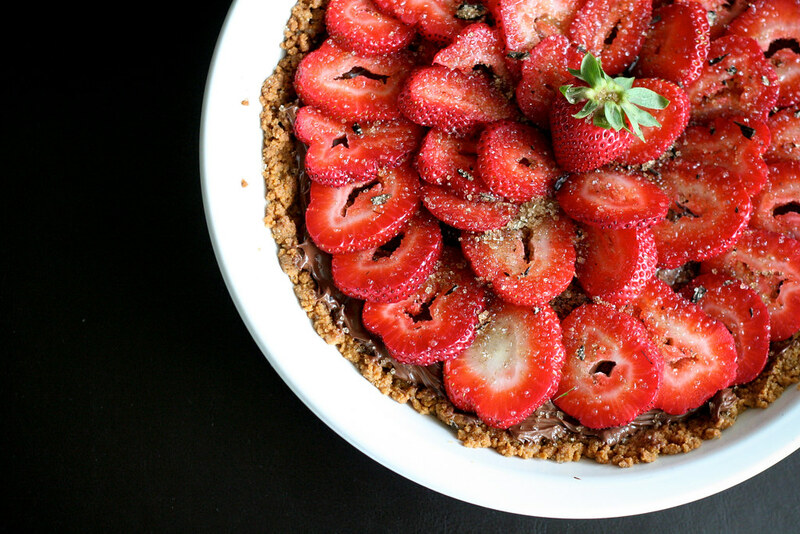 Creamy chocolate and hazelnut with juicy, tart and sweet strawberries. I literally cannot get enough. Perhaps that’s the reason why none of my pants fit anymore? This weekend I was asked to bring dessert to a very casual dinner. Now you may know that dessert is not really my strong suit. I usually blame my disinterest on too much precise measuring and finicky decorating, but what I really can’t stand about baking is the fact that you can’t taste and adjust along the way. And even when you’re done, you can’t sneak a bite of what you’ve made because it’s rude to show up at a party with a pie that’s missing a forkful. So frustrating! This tart doesn’t fix that particular problem, but it’s ridiculously easy to make and quite the crowd-pleaser. 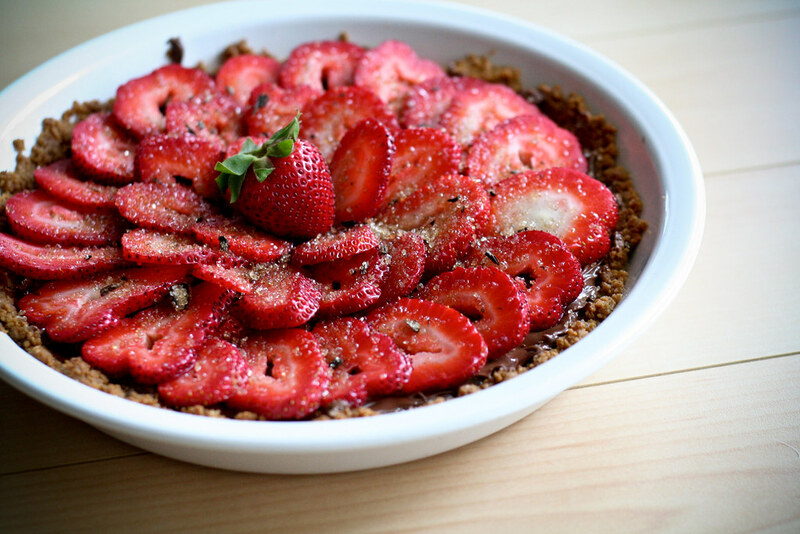 Building on my new obsession, I made a simple graham cracker crust topped with a thin layer of Nutella and strawberry slices. A sprinkling of coarse sugar on top and I was done. No one can resist the siren call of strawberries with Nutella and both tarts disappeared shortly after dinner. Sadly, I had no leftovers for breakfast the next morning, but the dessert was a total winner with the family. Preheat oven to 350Â°F and lightly grease a pie plate. Stir together the graham cracker crumbs, sugar and butter. When evenly combined, transfer the contents to a pie plate and press onto the bottom and sides of the dish. Bake for 12 minutes or until the shell is crisp. Remove from oven and let cool completely (about 30 – 45 minutes). After it’s cooled, gently spread the Nutella in an even layer. Arrange the strawberry slices in consecutive circles on top of the Nutella. When you’re just about to serve, dust the top of the pie with the coarse sugar. That looks like an awesome substitute for bday cake!!!! Can’t wait to try it!! Holy Batman that sounds/looks deliciouso. I must try and make that one! Woah, your confession may just be a new guilty pleasure I may have to indulge in!! and this tart…genius and beautiful! That looks super easy and so amazingly delicious. I can taste it. Who uses the word delicious anymore? Lol. I love this. I’m bookmarking it and if I happen to take photos for my own blog, I’d definitely crediting you for such a kickass combination. I have been reading your blog for about 6 months. I love your pictures and recipes. This recipe is really creative –I know it will taste just as delicious as you have described it to us! Can’t wait to try it. Thanks for sharing. omg i love your page, this recipe looks soooooo good! Wowzah!!! That is gorgeous darling! i love your blog, but honestly, i’m a big dessert person. so it’s extra-exciting for me to come here and see you’ve made something sweet. thanks; this looks awesome! This is a fantastic and really easy recipe. Crowd-pleaser is an understatement! I served it with vanilla ice cream and blew some minds at my party; thanks a lot! What a fabulously easy Summer pie! Thank you from the bottom of my appetite.